Born in 1881 in a home dug into the Kansas prairie near the town of Cuba, Minnie Hawks' arrival in this world set the scene for a life of hardship. Although I never met my second great-grandmother, surviving photographs depict a woman of unsmiling and stern disposition. How could she not be when her life was rooted in hard work and deep loss? In 1888, Minnie's father Edmond Hawks loaded his family and their possessions into a covered wagon led by a team of oxen and moved to Rossville just west of Topeka. Edmond opened up a barbershop where he employed and trained a young man named John Lumpkins. In January 1897, just a few months shy of her 16th birthday, Minnie and John were married. By 1901, they were parents to three young children. On his second birthday, the Lumpkins' youngest child, William Earl, died in his mother's arms. An August 1903 death notice in The Shawnee County News revealed that "the little one had been suffering with whooping cough and contracted a severe cold which settled on the lungs producing death." Years later, Minnie would tell family that she was still haunted by the terrifying sound of her toddler gasping at breath and life. Tragedy continued the following year. In September 1904, Minnie gave birth to her fourth child Irwin Roy. 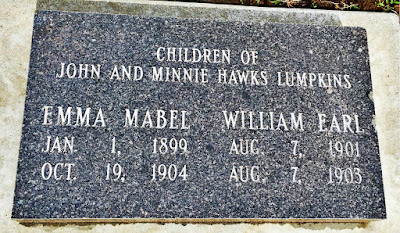 Less than a month later, happiness succumbed to grief when The Shawnee County News reported that the Lumpkins' five-year-old daughter, Emma Mabel, "died after a week's illness from dysentery." 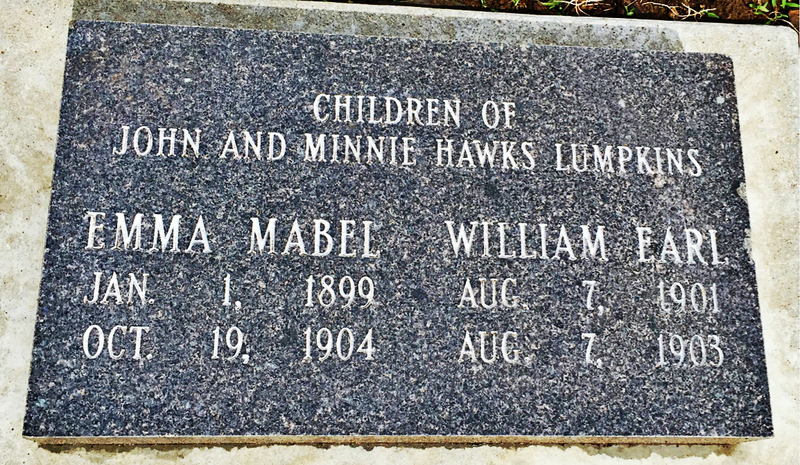 Young Emma was buried beside her brother in the Rossville Cemetery. The Lumpkins attempted to piece together their broken hearts and move forward with life. In 1907, their son (my great-grandfather) Marion was born, and, shortly afterwards, the family moved to Topeka where John worked in a barbershop his father-in-law Edmond operated. In February 1910, Minnie was expecting another child. Life seemed to have regained its footing. On the evening of February 23rd, John was walking home from work and slipped on some ice. He fell with great force and hit his head, but was able to get himself home. 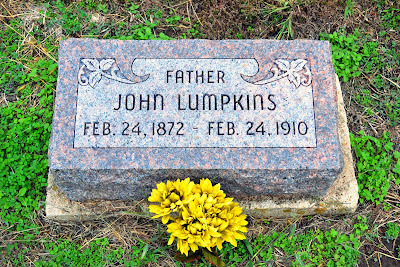 A Rossville newspaper wrote that, "Mr. Lumpkins was taken sick Wednesday evening and passed a restless night. In the morning he complained of dizziness and blindness. He was assisted by his wife to the lounge downstairs and she went immeditately for a nearby doctor. When she returned Mr. Lumpkins was unconscious and Dr. Keith was sent for. Upon his arrival he announced that the suffered could not live and death came at about 9 o'clock a.m. His death was due to appoplexy (sic)." The local paper wrote that John's passing on his 38th birthday "could scarcely be believed in Rossville and came as a distinct shock to his friends and relatives here." "His death was a shock because no one had any reason to expect such news. 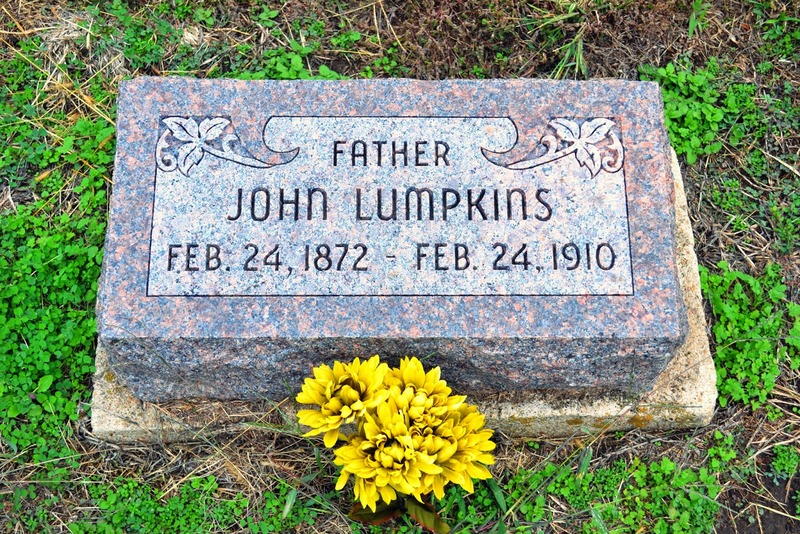 Mr. Lumpkins was yet a young man and known to be of rugged health. The end was undoubtedly unexpected on his part, for it was all so sudden - taken slightly ill in the evening - the next day he died." At the age of 28 with three young children to care for and one on the way, Minnie was a widow. In October 1910, tragedy struck once again. 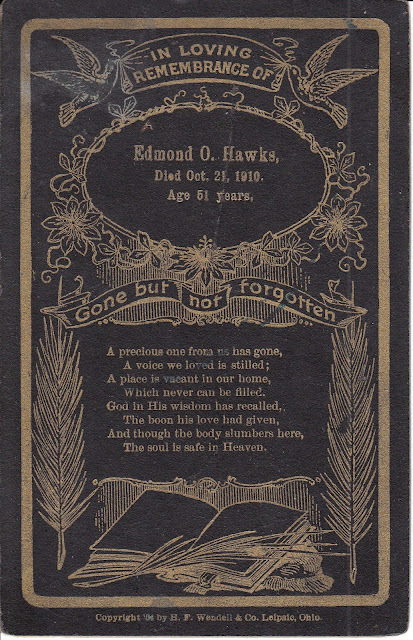 Minnie's father Edmond Hawks passed away. The paper wrote that he had "been suffering for the past eight or ten weeks with a sort of paralysis [and] died at his home on the Howerton ranch north of town [Rossville]." He was just 51 years old. In one year, Minnie had lost both her husband and father. Their losses must have stung deeply with the uncertainty of how to provide for her young family. For a time she lived with her mother and worked odd jobs. Eventually she began a new chapter in life. She remarried in October 1914 and gave birth to four more sons, each of whom enlisted during World War II. Minnie lived until the age of 92. 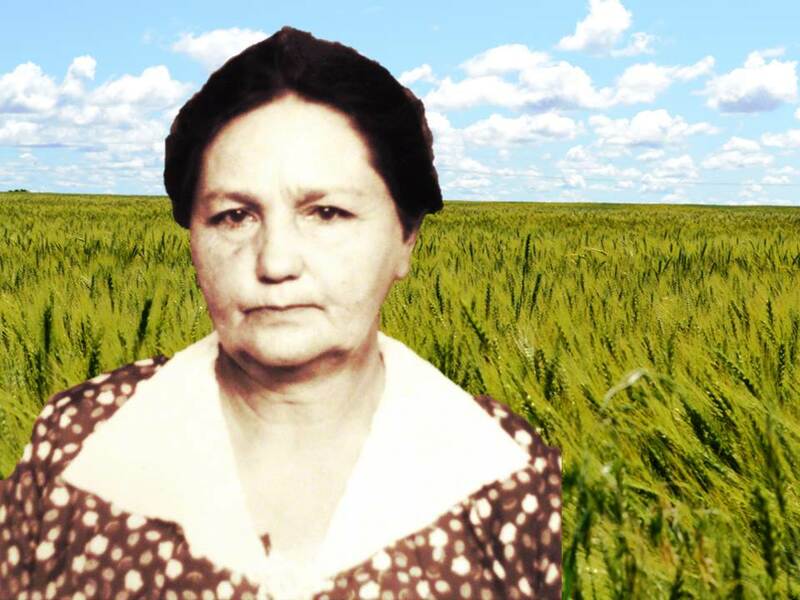 I imagine the hardships she suffered early on fortified her for the challenges that were endemic to life on the early prairie. Where some would crumble under the heavy burden of loss, she was strengthened and persisted. Perhaps a steely exterior was the key to her survival and longevity. Thank you, Cathy. I really appreciate the compliment, and, you're right, she makes a great contribution for Women's History Month! Wow. I don't know what to say. This is such a story of enduring to the end. What a woman she must have been. Thanks for sharing her story. Thanks, Amie. I think her love of family must have been what helped her find the strength. My grandmother told a story of visiting Minnie in the nursing home in her final year when her memory was fading. She couldn't remember names, but would always say, "I know you're one of mine." 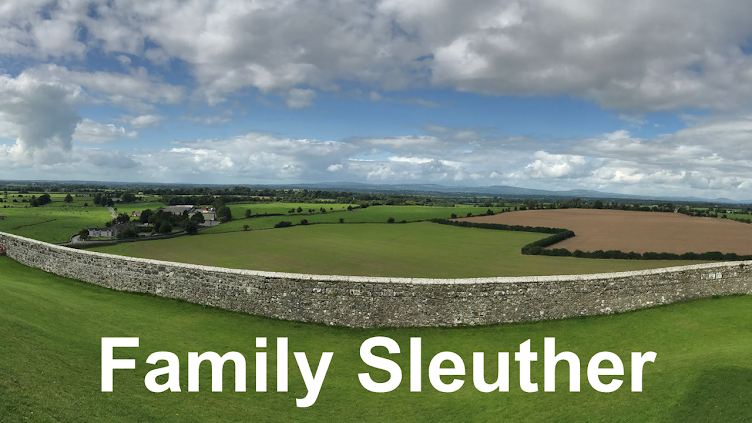 Family was in her core - she survived and thrived because of them.